Sorry if Like Merchant Ships' tone has seemed less than cheerful lately! We all have a lingering cough, and several sleepless nights have taken their toll. 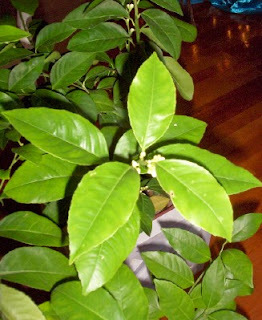 I've been so "out of it", I didn't even notice that my $7 lemon trees are covered in buds! I've been worried I'd kill them through neglect, but here they are, blossoming all by themselves. How neat! Can you explain how one cares for lemon trees (eventhough you feel you've been neglectful)? Do you keep them indoors year round or do they go outside for the spring and summer? How often do you water them? Is fertilizer necessary? etc., etc. Donna, I have no idea! I have had them since September, where they sat o my back steps until frost. Then they moved into my dining room and have barely been watered since.